Turtles and tortoises of different species have shells that vary in size, color, and shape but they all have one thing in common - their shells are hard and protective. Sometimes environmental conditions, nutrition, diseases, and trauma can alter the appearance and effectiveness of these shells and knowing more about them can help you determine whether or not your turtle or tortoise is healthy. Turtles and tortoises have a carapace (the top or dorsal shell) and a plastron (a bottom or ventral shell), both of which should always be hard (unless it is a very young turtle or a species of turtle that always has a soft shell). Both parts of the shell are connected to protect the turtle's organs and the majority of its body. The turtle shell is made up of visible sections referred to as scutes. Scutes are similar to hair and nails since they are made up of keratin. These scutes will normally shed off as individual sections as the turtle grows and sheds their skin but the bone underneath the scutes should never be exposed. The turtle's spine and ribs are attached to the bone that the carapacial scutes protect as well as many nerve endings. Since turtle shells can vary in appearance from species to species, some tortoises and turtles naturally have peaks to their shells (such as the Indian Star Tortoise) but most do not. Pyramiding refers to the abnormal shape that the individual sections (scutes) form in the shape of a pyramid or raised peak. It is usually a husbandry issue and occurs with chronic malnutrition or inappropriate lighting. Wild turtles and tortoises do not get this problem unless some sort of trauma causes the shell to appear to be pyramiding. Too much or too little of a specific dietary requirement, no UVB lighting, and a lack of calcium or Vitamin D can all aid in the creation of pyramids on your turtle's shell. These malformations are completely avoidable by providing appropriate foods, lighting, and environments for your turtles. These pyramids will remain for the life of your turtle, even after correcting the problems with the husbandry. "Rot" is a term that reptile enthusiasts use to refer to an infection somewhere on the body. Shell rot obviously refers to an infection of the shell. Both the carapace and plastron can get shell rot. Shell rot is usually acquired from dirty environments, such as dirty water (therefore it is important to know how to keep the water in your aquatic turtle tank clean) or moldy bedding. It occurs when bacteria starts flourishing on the shell of a turtle and will eventually cause it to look like rotting fruit with small pits and divots or give it a moth-eaten appearance. Soft spots may start to form or even have areas of discharge. 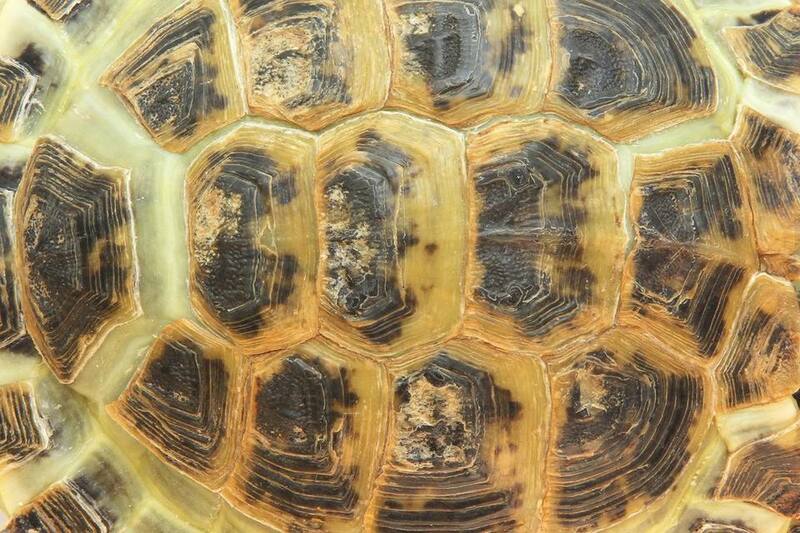 Very bad shell rot will cause entire scutes to fall off, exposing the bone (and nerves) underneath. Shell rot needs aggressive antibiotics to treat and will take a long time to heal. Contact your exotics vet if you think your turtle has an infection before it causes pain to your turtle. Septicemic cutaneous ulcerative disease (SCUD) is a serious disease that can start as an infection on the shell from some sort of trauma or wound combined with poor husbandry. It will eventually affect the liver and other organs due to the bacteria that enter the bloodstream from the wound on the shell. You should get your turtle or tortoise checked out by an exotics vet if he ever has any wound or trauma. Individual scutes should naturally shed off and expose only new scutes underneath. If scutes are falling off and exposing the cream/white bone then there is most likely a serious infection or some sort of trauma that has occurred to the shell. Exposed bone is painful to your turtle and is very serious. MBD (metabolic bone disease) is a result of your turtle receiving inadequate calcium, Vitamin D, and UVB rays. It causes their bones to lose their density and their shells to eventually soften or become malformed. It can be easily avoided with proper husbandry and nutrition and often times corrected with aggressive therapies. All in all, turtle shells should typically be free of algae, fairly smooth and even, and hard. There are always exceptions to the rules but if your turtle or tortoise's shell ever looks strange to you be sure to get him checked out by his vet. Reptiles heal and grow very slowly so it may take years for the effects of shell damage to disappear if left untreated.